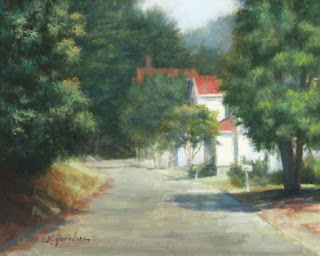 Linda's Witness in Art: "Presidio SF Military Base"
quite awhile now has become a national park. It had been a fortified location since September 17, 1776, when New Spain established it to gain a foothold in Alta California and the San Francisco Bay. It passed to Mexico, which in turn passed it to the United States in 1848. As part of a 1989 military reduction program under the Base Realignment and Closure (BRAC) process, Congress voted to end the Presidio's status as an active military installation of the U.S. Army. On October 1, 1994, it was transferred to the National Park Service, ending 219 years of military use and beginning its next phase of mixed commercial and public use.